Chemring Nobel is a world leading NTO manufacturer. Our NTO is a key ingredient in today’s state of the art IM compliant ammunitions. NTO is a powerful yet very insensitive high explosive, making it attractive for a range of applications. For more than 20 years, we have evaluated NTO as the most promising explosive candidate for future Insensitive Materials (IM) applications. We have been producing NTO in industrial quantities regularly since 2006. NTO consists of white/off-white crystals with a melting point of approximately 272 °C and a crystal density of 1.9 g/cm3. We can supply a range of NTO crystal sizes and size distributions — and are developing new formulations for future IM applications. 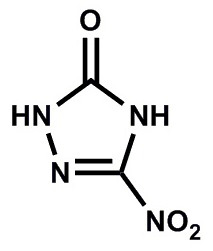 NTO was synthesized as early as 1905, but its explosive properties were not discovered until the 1980’s. NTO is significantly less sensitive than RDX and HMX. NTO consists of opaque crystals with a jagged appearance, although different morphologies can be produced. Its melting point, 273 °C, and crystal density of 1,91 g/cm3, are comparable to HMX. NTO’s sensitivity properties make it attractive for the Insensitive Munitions market. Performance wise, NTO has a detonation velocity at maximum density of approximately 8600 m/s. Its detonation Pressure is approximately 32 GPa, or slightly less than RDX. NTO is water soluble with acidic properties, a factor that is important to consider during handling. Chemring Nobel done full scale production of NTO since 2006. We deliver NTO according to NATO STANAG 4544 specification requirements and also specific customer requirements. The STANAG specifications do not specify crystal sizes and size distributions. These parameters are normally adapted to customer requirements. We typically produce a “coarse” class product with a d50 of approximately 400 microns and a “fine” class product with a d50 of approximately 70 microns. We can also deliver a “micronized” class product with a d50 of approximately 10 microns. Melt-cast compositions based on NTO are expected to replace the traditional use of Hexotols and Comp B in systems where low sensitivity is important. (Insensitive Munitions). Typical use is for main charges in artillery shells. We are in the process of qualifying several melt-cast formulations based on NTO together with either RDX or HMX — and with TNT or alternatively DNAN (DiNitro ANisole)as matrix. These compositions are delivered as the MCX-6000 series (NTO+RDX) or the MCX-8000 series (NTO+HMX). NTO is transported dry, without phlegmatising agents such as water or a plasticiser. It is therefore of less interest to make phlegmatised pre-coated compositions based on NTO.